Day four was a huge success! We were a little late getting around and getting off the ground, but we were wheels up around noon. We were very curious and worried about some clouds we ended up flying right over and no issues with icing or getting stuck anywhere. We made our first fuel stop in KPBF, Pine Bluff Regional Airport Grider Field, for some incredibly cheap fuel and fun entertainment. After a quick trip into town for some diner food, we went back and enjoyed the culture that is incredibly accurate to the stereotype in Arkansas. The next thing I knew we were off to our final destination for the day, Huntsville Alabama International - Carl T Jones Field. Sunday the 11th was a lazy non-flying day. My good friend, that is going to be on the trip with me, and I decided to rest and catch up on some R&R before we start the long journey! We also decided to wait at home for my mom and grandma to get back home so I could spend some more time with them before I head off! It was a great break and much needed. All of the devices are charged up and we are ready to hit the airways and see what the country has to offer! It was a crazy last couple of days, but I am finally catching back up, so I am so sorry for the delays on the blog! On day two I woke up bright and early at 0530 and was on the road to the airport at 0615 with a very hopeful takeoff of 0700. I have missed the sunrises in the midwest and it was nice to experience it again driving and up in the air. Wheels up retracted perfectly at 0715 and I was off to Claremore Oklahoma. My two hour journey had started as I was off to surprise my family (Mom, Nana, Aunt, and little Cousin) at my little cousins dance recital. I was kinda worried about what the airport was going to be like after seeing the airport diagram that fore flight has posted on the taxi diagram. My dad and I were even joking and questioning if oklahoma runways were as rough as Oklahoma roadways, a question I soon figured out. For a small town on the map, Claremore has lots of oil money which I had completely spaced off. This lead to the complete surprise I faced when I landed and the whole East side of the airport were very nice hangers and a very full and bustling ramp! I wheeled onto the ramp like all mooniacs do (like I owned the place) and parked next to a single commander. I grabbed the car and headed off to watch my little cousin take first in her division and tenth overall. After lunch and more dancing I had the plane topped off, paid the bill, and started up. I taxied out behind an archer and waited for the trainer to take the runway and slowly climb out. 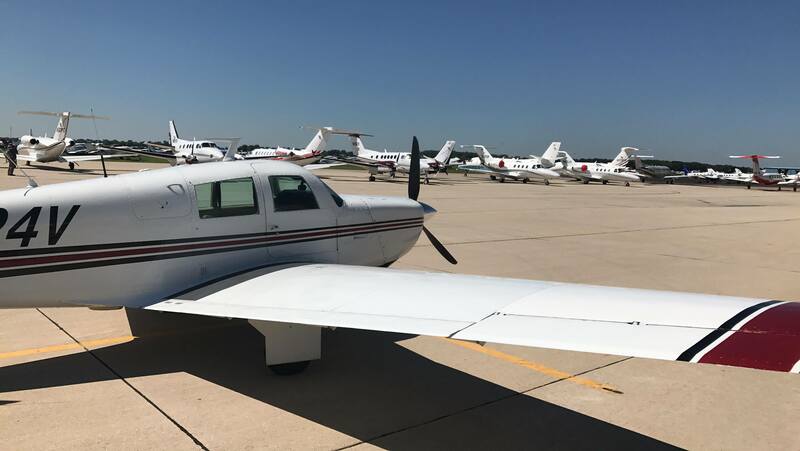 I took the runway and jetted out direct to Wichita's Dwight D Eisenhower International Airport to pick up one of my friends that is going on this adventure with me. After picking him up we headed back to my home base airport and put the aircraft to sleep and hung out with my family and family friends the rest of the night! I would suggest a cream seat with a burgundy trim and stitching. A light grey would also be complimentary but not quite as pleasing to the eye! I will be close to the area around March 13th-15th if you are still enjoying all of the Florida sun. I would love to fly in and see the area and that airpark. I have heard some great things about it!! Well for the right price mine is always for sale. PM if you are interested. I agree on such a personal level, and I avoid the mountains in my Mooney after May! The climb outs are about as fast as the terrain climbs if you want to keep fast IAS to keep your engine happy! The next aircraft or Mooney model will definitely have a turbo so I don't have to go rent a bonanza to get where I need on a hot mountainous day. Thank you so much carusoam! Good Afternoon fellow Mooniacs, I am relatively new to the forum and have been noticing a lot of users on this website have neat color coated maps for their signature lines. I am sure there are threads that explain how y'all do that, but I am unable to find them! I would like to be able to start color coating a map on where I fly the Mooney, especially since I am going to be doing an across the US cross-country this month. Welcome aboard! I go to school in Prescott Az, and enjoy flying up to Salt Lake City to do some skiing! I have a old but beautiful M20E and I can tell you, you will want a turbo charged engine especially in the summer going in and out of any mountain locations! Unfortunately my shop has done everything that they can, since they aren't a Mooney specialist shop. They as well as myself know the reason it is so sloppy is from the bad wear over the years. New rod ends, fittings, etc..., are all going to be needed to tighten it up. All I know is that my Mooney was solid and stable before the new rubbers were put in and now with the change something needs to be replaced before I really feel comfortable in my baby again. I just had the donuts replaced on my gear, but of course that caused other issues. After just purchasing the aircraft we have found that they hadn't been replaced since 1970. With a long time of bad wear on nose gear she now has a lot of slip and slop in the nose gear, and isn't ideal when I am taxing, flying, and landing in a lot of crosswind. I have heard that LASAR is the place to send in the gear for an overhaul, what do y'all think and recommend?